Held in one of New York’s most exciting locations at the Turning Stone Casino & Resort, surround yourself in a setting rich with adventure as you spend three exciting days filled with networking, showcasing, and learning. There are endless opportunities for exhibitors at our signature tradeshow, which takes place beginning Monday, June 10 at 1:00 p.m. In addition, we also have various sponsorships available including platinum, gold, silver, and bronze sponsorships. Our educational agenda is packed with intriguing speakers who will cover important issues in the industry, while giving you the chance to earn up to 12.5 CPE credits. There are also two Convention favorites returning this year: our 6-minute drills and the PAC Silent Auction. Our 6-minute drills offers our preferred partners the opportunity—from the podium—to take a brisk six minutes and showcase their firms, products, and services, demonstrating what they can do to help New York community banks. There are also sponsorships available for some of our 6-minute drills. Next, we have our PAC Silent Auction which takes place on Tuesday, June 11 at 5:30 p.m. This popular convention feature is the perfect opportunity to showcase items from your region, while contributing to an essential committee that focuses and advocates for community banks in NYS legislative affairs. 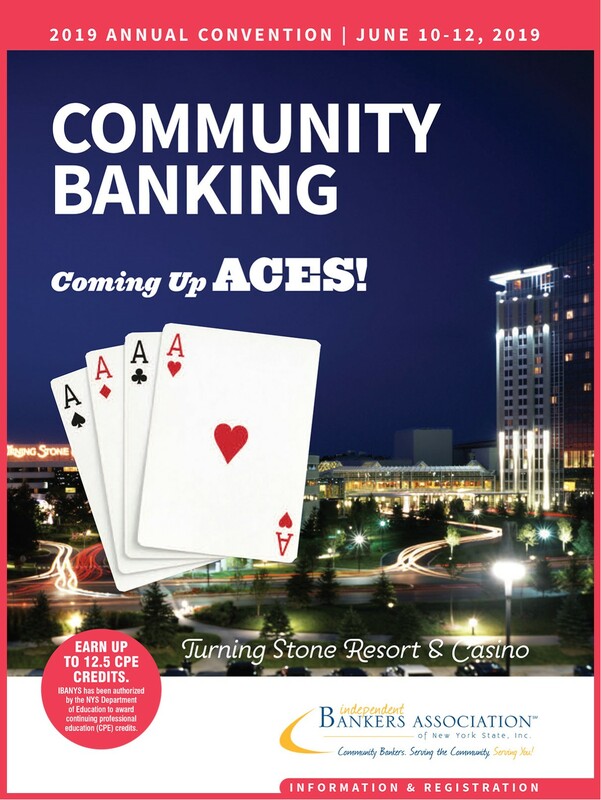 With our Convention located at Turning Stone Casino & Resort, you are just steps away from various fun activities such as dining, gaming, live entertainment, etc., all centered in one convenient location. So don’t miss out on three fun packed days education, networking and exploring. Register today! Held in the heart of the state’s capital at the Hilton Albany, surround yourself in a setting rich with history as you spend three exciting days filled with networking, showcasing, and learning. There are endless opportunities for exhibitors at our signature tradeshow, which takes place beginning Tuesday, September 25 at 1:00 p.m. In addition, we also have various sponsorships available including platinum, gold, silver, and bronze sponsorships. Our educational agenda is packed with intriguing speakers who will cover important issues in the industry, while giving you the chance to earn up to 12.5 CPE credits. There are also two Convention favorites returning this year: our 6-minute drills and the PAC Silent Auction. Our 6-minute drills offers our preferred partners the opportunity—from the podium—to take a brisk six minutes and showcase their firms, products, and services, demonstrating what they can do to help New York community banks. There are also sponsorships available for some of our 6-minute drills. Next, we have our PAC Silent Auction which takes place on Wednesday, September 26 at 5:30 p.m. This popular convention feature is the perfect opportunity to showcase items from your region, while contributing to an essential committee that focuses and advocates for community banks in NYS legislative affairs. With our Convention located in downtown Albany, you are just steps away from the NYS Capitol Building where we work to give your organization a voice. There are also various local attractions that are in walking distance or a quick Uber-ride away from the Hilton Albany. So don’t miss out on three fun packed days education, networking and exploring. Register today! *Each attendee must make their own reservations by calling the hotel directly at 1-800-771-7711. To ensure receiving the group rate, use group code IBANYS Convention. *If you have any dietary restrictions, please contact Linda Gregware at (518) 436-4646 or lindag@ibanys.net. Fees include access to all events, course materials and meals for the entire event. For those who only want to attend specific days, this includes access to all events for day registered, course materials, and meals. Full refund less $75 on or before 5/17/19. Full refund less $150 on or before 5/24/19. No refunds will be given after 5/25/19.